This Irish onesie features contrasting green trim and has reinforced snap closure at the bottom for easy dressing and diapering. The Irish baby onesie is constructed with double-needle ribbed binding on the neck and shoulders along with the sleeves and the leg openings. 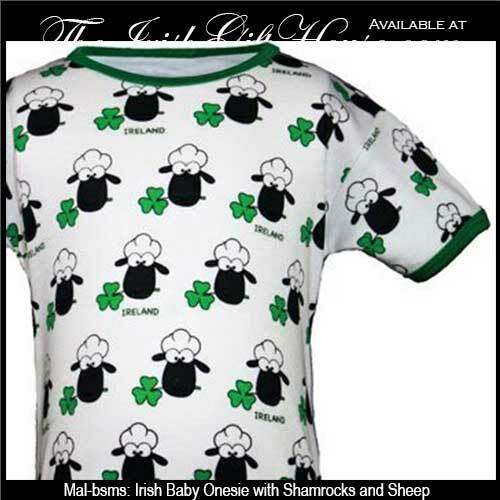 This Irish baby bodysuit features an all over fluffy sheep design along with green shamrocks. The Irish onesie is crafted from a snugly soft 50/50 cotton and polyester blended material and it will be an ideal gift for a newborn and it will make an exceptional baby outfit for picture day or on St. Patrick's Day. 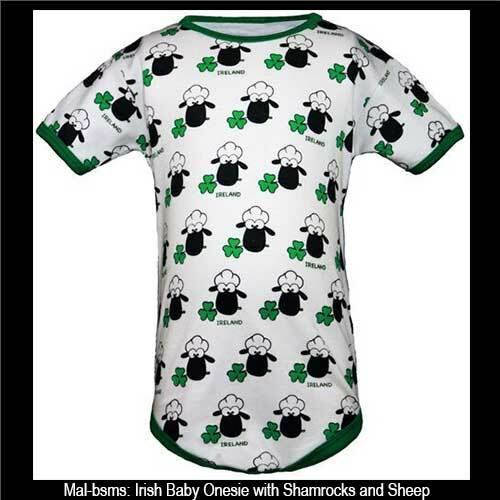 The Irish baby onesie is received with a shamrock history card, complements of The Irish Gift House.